To Sum It Up: While on a European tour the summer before beginning her freshman year of college, Allyson Healey meets Willem, an actor with a roving Shakespearean performance troupe. After a second chance encounter on board a London-bound train, it seems that fate keeps putting the two in each other’s path. And so, on an uncharacteristic whim, Allyson’s journey takes a detour to Paris with Willem. But after spending an unforgettable day together in the city, Willem disappears. Shattered, Allyson returns home and tries to move on and maybe become more of the daring person she was that day in Paris. Review: Still dealing with a vicious book hangover from Queen of Shadows, I felt the need to totally change gears with my next read. Just One Day called out to me from the shelf, and at long last, I picked it up. I loved Gayle Forman’s If I Stay and Where She Went, plus the short story she contributed to the holiday-themed anthology My True Love Gave to Me, so I was very excited for Just One Day. Once again, Forman’s characters, storytelling, and this time, international locales, reminded me why she’s my go-to author for contemporary, a genre that I often struggle with. I don’t think I’ve ever connected with a protagonist in a contemporary novel as much as I did with Allyson. Like her, I find it difficult to step outside of my comfort zone and would rather retreat to its safety than give in to impulse and the unknown. I also completely understand the compulsion to please everyone, even when it comes at the expense of your own goals and desires. Allyson must further deal with a micromanager for a mother; there is no aspect of Allyson’s life that her mother doesn’t involve herself in. All of these factors create the impression of a life that’s at the very least stifled, but Allyson gets her chance to break out and inhabit a different person once she meets Willem. About the first third of the book centers around Allyson and Willem’s chance meeting in Stratford-upon-Avon followed by their whirlwind day in Paris. Their instant chemistry is astronomical and makes a very convincing case for the existence of soul mates. This is a huge concession coming from a skeptic like me. The beginning of Allyson and Willem’s story is the stuff that swoons are made of—exhilarating and sweet and for Allyson, liberating. With Willem, she’s Lulu, the person she might have dreamed of being but would never dare to in real life. Their connection is forged so strongly that it’s easy to forget that they’ve just met, making Willem’s disappearance once that single day draws to a close all the more devastating. When the novel resumes, Allyson is at college and having an extremely hard time moving past what happened in Paris. She’s doing poorly in school and keeps to herself. Her climb out of a deep depression is slow and arduous, but progress is steadily made. Along the way, Allyson learns what it means for her to be Allyson and not the Allyson everyone else, especially her mother, wants her to be. Shakespeare’s plays figure prominently in Allyson’s road to figuring out who she is, and I absolutely loved how Forman interweaved them throughout the novel. I also love when books carry you away to places you’ve never been, in this case, Paris for me. 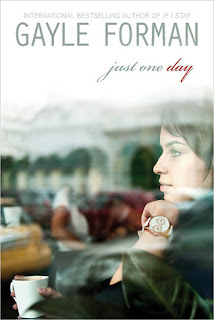 Just One Day paints a vivid tableau of the City of Light that completely immerses you; it’s like you’re right there. I’ve always wanted to visit Paris, but now more than ever after reading this book. This was such a fantastic, engrossing read—thought-provoking, poignant, and wonderfully developed. It’s always a little extra satisfying whenever a contemporary read works out for me, as this one did. I can’t wait to dive into the companion novel, Just One Year because I must know the rest of Allyson and Willem’s story. All in All: I identified on so many levels with Allyson’s personality, so Just One Day turned out to be quite a personal read for me. Even if I hadn’t felt drawn to Allyson’s character from the start, though, I think I still would have gotten as much out of the novel because it’s so moving and so beautifully written. It's hard to find a book to read after QoS. A touching contemporary is a good choice, gotta get the feels! Yes! This ended up being a really good choice to follow QoS, although I STILL have so many feelings about QoS that I just can't shake, lol. I've heard just how intense QoS is, and I'm happy that you found such a great book like Just One Day to read after it. I've actually haven't had the chance to read Gayle Formal novels (though I have all of them... weird), and I feel like this is the one I should read first. Allyson sounds like a character whom I can connect with, and I adore beautifully written books! Thank you! :D I've loved all the Gayle Forman novels I've read so far, and she's definitely the contemporary author I've had the most success with. Hope you try one of her books soon! I knew I couldn't read another fantasy immediately after QoS because NOTHING was going to compare to it, lol. So I figured that this was a really good opportunity to go for something totally unlike QoS, and it helped ease the QoS withdrawal a bit. But I still don't consider myself completely cured, hahaha! OMG! Such a great review! I agreed with everything you said! When I first read this one I went into a huge skeptic. I knew it was basically about insta-love and I didn't think it would work, but Gayle Forman pulled it off. You could totally believe that Allyson and Will had been dating for years and years. And the writing was just beautiful. I think the main reason, like you said, that I loved this book so much was because how much I connected with Allyson. She goes through what I go through. I'm the same kind of person with the same kind of doubts and it was so moving to read =D. A tip though, when you are reading Just one Year, have Just One Night ready. You will freak out at the end of JoY (I just realized what the abbreviation for Just One Year is, lol :D), I am not kidding. Thanks for the advice! :D I downloaded Just One Night onto my Kindle immediately after finishing Just One Year, lol. You're absolutely right- having Just One Night ready to go is absolutely ESSENTIAL! It's very heartening to know that Gayle Forman is so great for you when you are not as big a fan of contemporary like me! I've not yet read one of her books, but this one sounds like something I would love - romantic and takes place in England and Paris! I love the sound of the romance even though I'm not big on insta-love! I feel like this will be a good travel read, and I hope to go to England next year, so maybe I'll save it for then. :) Great review!